All routers are running EIGRP protocol as well as multicast routing. Configure PIM on all router's transit interfaces in the topology diagram (pic.1) allowing Cisco Auto-RP. R1's Loopback should be advertised as RP candidate for the groups 224.6.6.0 - 224.6.6.255. R5's Loopback should be advertised as the Mapping Agent. Auto-RP advertisements should be sent every 10 seconds. Ensure, that routers do not use PIM Dense-Mode for the unknown groups. 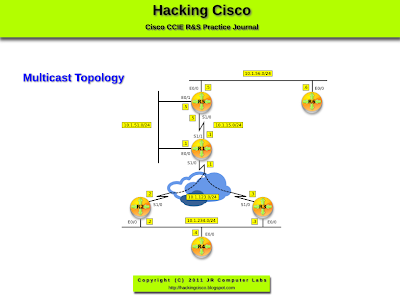 Configure PIM on all router's transit interfaces in the topology diagram (pic.1) allowing Cisco Auto-RP. R1's Loopback should be advertised as RP candidate for the groups 224.6.6.0 - 224.6.6.255. R5's Loopback should be advertised as the Mapping Agent. Auto-RP advertisements should be sent every 10 seconds. Ensure, that the routers do not use PIM Dense-Mode for the unknown groups. In order to advertise itself as a RP, the router must know which router is RP first to register 224.0.1.39 group (its multicast announcement). Since, there is no RP elected yet, the candidate RP cannot register itself and announce itself as RP. Sparse-Dense-Mode solves this vicious circle. The groups 224.0.1.39 and 224.0.1.40 are flooded as the Dense-Mode since the RP is not know for these groups. The caveat with the Sparse-Dense-Mode is that the groups not registered will also be treated as Dense-Mode flooding all subnets. To prevent this from happening the 'no ip pim dm-fallback' command is used. Both the candidate RP and Mapping Agent, must have their loopback enabled for any PIM mode. Pic. 2 - R6's Auto-RP Info. Pic. 4 - RP Announcements.